I hope you have all had a good Christmas. We had a lovely time at my sister and brother-in-laws home celebrating a big birthday for me as well as Christmas. 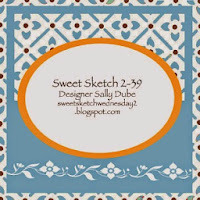 We came back yesterday through the fog and today I have had time to play with last Wednesdays Sweet Sketch Wednesday 2 sketch. The image is from Lili of the Valley and is coloured with Polychromos pencils. Great take on the sketch Anne and I see you were a winner, well done, love this card, great colours and image. Don't need reminding it is my turn for the snacks in Jan.
Oh how precious!! A fabulous birthday card. Happy Birthday to you!! And thanks for joining us at Sweet Sketch Wednesday 2. Happy birthday Anne! Adorable card this week. Love that darling image and your banners along the bottom. Happy New Year to you and thanks for playing along each week at SSW2! Oh Anne Happy Belated 50th Birthday my friend. Sorry I haven't wished you Happy Birthday before now but we are still up at our beach house where we celebrated Christmas and New Year with very limited Internet access. The weather is stunning getting to a stage that you can't sleep at night with the heat. We've spent a lot of our time out fishing catching some yummy meals on our boat and the boys biscuiting from behind and flying through the waves. Tomorrow we hope to drag for scallops from the boat. I'm so glad you had a lovely birthday, I have a brother that celebrates his on the 30th Dec and a cousins on the 25th Dec and a friend on 1st Jan and a nephew on the 5th Jan. What day is yours? I thought mine was bad enough on 30th November as it gets into the silly season and everyone is preparing for Christmas. I just adore your card so so cute and this LOTV image couldn't be more perfect especially for a masculine card. Take care and have a great week and happy crafting and thanks so much for joining us over at Sweet Sketch Wednesday 2 and good luck.